Product prices and availability are accurate as of 2019-04-18 17:45:37 EDT and are subject to change. Any price and availability information displayed on http://www.amazon.com/ at the time of purchase will apply to the purchase of this product. A business without a sign...Is a sign of no business? Bright Oval Red and Blue "Open" Sign. 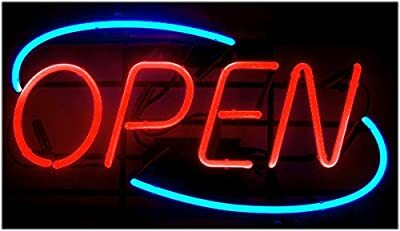 Indoor ONLY - Large sized 24"x 12" 100% handcrafted real glass neon signs made by experienced neon glass benders. Perfect for hanging on the window. Chain and power adapter included.